ANAHEIM, Calif. (AP) — Daniel Sprong didn’t waste time making a positive first impression on the Anaheim Ducks. Sprong gave Anaheim a 2-0 lead six minutes into the first when he beat Chicago goaltender Corey Crawford top shelf with a shot at a sharp angle that just went over Crawford’s shoulder. Anaheim coach Randy Carlyle was pleased with Sprong’s performance despite having only one practice with the club. “You could tell in the first period we were playing with a lot of confidence. That comes from building off earlier games knowing that we are playing real good right now. We have to keep it going,” Silfverberg said. Montour put the Ducks on the board 20 seconds before Sprong’s goal with a 54-foot wrist shot that got past a screened Crawford for his third of the season. The Ducks came into the game next-to-last in the NHL in first-period goals but scored a pair in the first 20 minutes for only the third time this season. Gustafsson put the Blackhawks on the board seven minutes into the second when he took Duncan Keith’s pass in the right faceoff circle and beat Gibson with a slap shot for his fifth. DeBrincat then tied it with 28 seconds remaining in the period when he took a feed from Jonathan Toews and put it into the net for his 11th. Kase took back the lead for Anaheim four minutes into the third when he took Carter Rowley’s pass off the boards and fired a shot from the right circle for his fourth in the past nine games. Silfverberg then put it out of reach with an open-net goal late in the third for his sixth. NOTES: The teams have split their two games this season. Their last meeting will be Feb. 27 in Anaheim. … Kase, who has a point in seven of the last eight games, has eight career game-winning goals. … Anaheim C Adam Henrique extended his points streak to six straight games with an assist on Sprong’s goal. He has a goal and five assists in that span. … RW Pontus Aberg has three goals and two assists in the last three games. 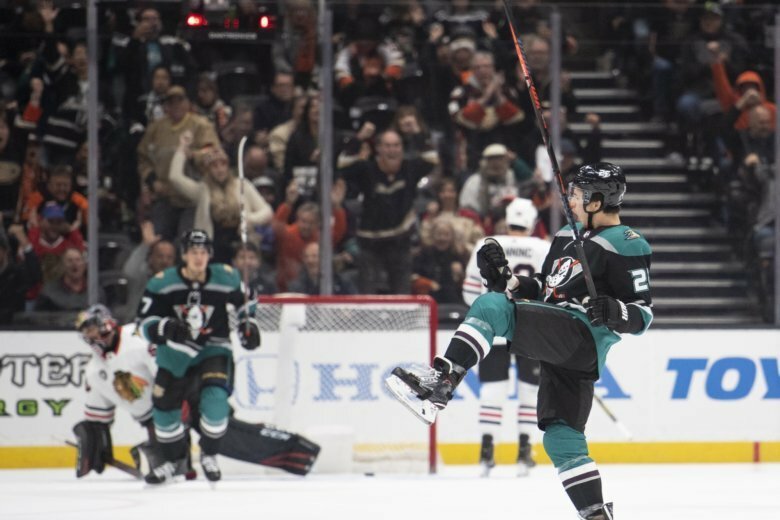 … DeBrincat has eight points (four goals, four assists) in five appearances against the Ducks.